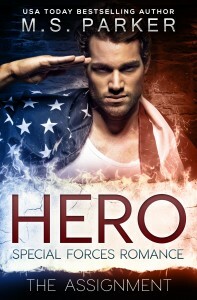 Haze Welch used to serve his country in the Special Forces. Now he’s relegated to babysitting spoiled heiress Leighton Machus, the party girl with whom Haze had a one-night stand four years ago. A one-night stand he hasn’t been able to get out of his mind since. Despite her behavior, he can’t help but think there’s more to Leighton than what she portrays. And there’s definitely more to the situation than meets the eye. I couldn’t get her out of my mind, but to save her life, I just might have to. After all, one spoiled little girl would be a piece of cake compared to everything else I’ve been through, right? Don’t miss HERO: The Assignment, MS Parker’s first military romance.